Cat communication is the transfer of information by one or more cats that has an effect on the current or future behaviour of another animal, including humans. Cats use a range of communication modalities including vocal, visual, tactile and olfactory. Cat vocalisations have been categorised according to a range of characteristics. (1) sounds produced with the mouth closed (murmurs), including the purr, the trill and the chirrup, (2) sounds produced with the mouth open and gradually closing, comprising a large variety of meows with similar vowel patterns, and (3) sounds produced with the mouth held tensely open in the same position, often uttered in aggressive situations (growls, yowls, snarls, hisses, spits and shrieks). Responses to "Funny talking cat asks the owner to open the door. 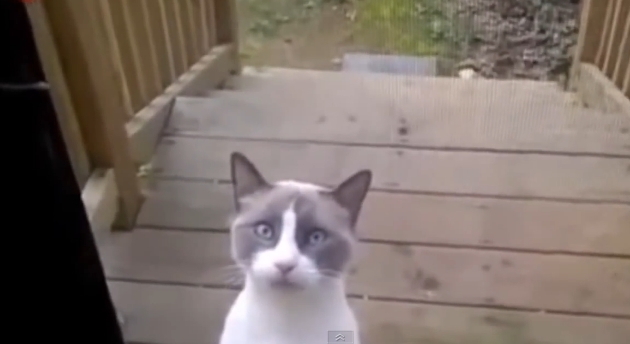 (Video)"
That cat needs some serious loving. Now, who gets to do it? Something the owner does agitates the cat! The closer the owner gets to the cat, the angrier it gets. Talk about expressing emotions! Nice job kitty! The owner reacts in a very unemphatic way to the cat. But I would hate to have my cat act like that.